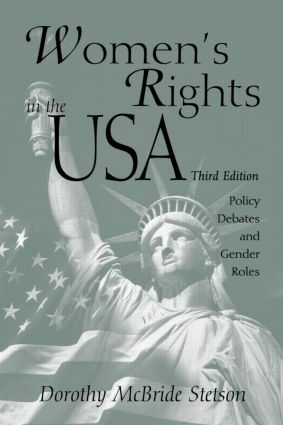 Women's Rights in the USA is a rigorous examination of the intersection of gender roles and public policy and a survey of the feminist debates that complicate and frame U.S. law, statutes, and court decisions. The third edition includes updated and expanded information pertaining to recent debates, legislation, and court decisions on affirmative action, equal protection, welfare reform, and sexuality, especially lesbian politics and violence against women. Is There a Feminist in the Court? An Amendment for All Seasons? What’s in a Name? Or NARAL By Any Other Name . . . The Gender Divide in Vocational Education: Is It Bridgable? Could Mr. McGuire Afford To Pay for Indoor Plumbing for Mrs. McGuire? Primary Caregivers v. Shared Parental Responsibility: Can You Find the Gender Bias? Relief for the Sandwich Generation? Has the Violence Against Women Act (VAWA) Made Any Difference? Putting Sexual Autonomy First: A Model Statute? Domestic Violence: The Equal Opportunity Crime? Who Will Speak for Older Women?